The musculoskeletal system, which encompasses a complex system of bones, ligaments, tendons and connective tissue, can be difficult to understand. That's why complexities of a distal radial injury require the help of a specialist, like the experts at Coastal Orthopedics on the Texas gulf coast, to properly heal. The distal radius is a bone that is located in the forearm. The radius is the larger of the two bones in the area while the end portion towards the wrist is referred to as the distal end. Therefore, when the radius bone close to the wrist breaks its diagnosed as a distal radius fracture. Like most fractures, signs of a serious injury in this area are often obvious. While bone wrist fractures are more severe than others, the most common sign of a break in the distal radius is intense pain. A broken wrist is also characterized by swelling. In some cases, the swelling can get so bad that is becomes difficult or nearly impossible to move the injured hand or wrist. A tingling sensation in the fingertips or there may be limited finger movement. Depending on the severity of the fracture there may even be a physical manifestation of the break. For instance, if a bone comes out of place your wrist may appear deformed. Immediate sharp pain after the accident takes place. Sometimes the fracture may be accompanied by the sound or the sensation of a bone breaking. You may experience abnormal swelling and tenderness in the wrist immediately that only worsens. A numbness that doesn’t allow you to move your fingers or hand. The direct causes of a distal radius fracture can be contributed to many different factors. Falls. 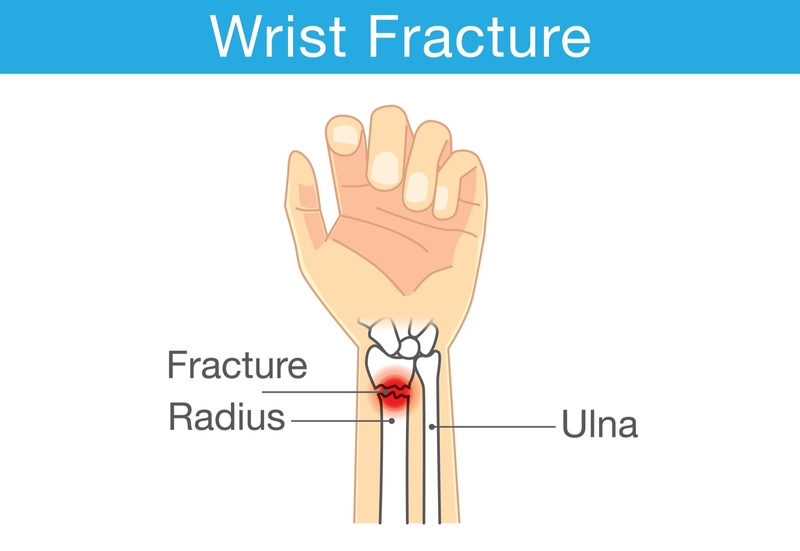 The most common cause of a distal radius fracture is a bad fall onto an outstretched arm. Such a fall can occur while completing daily activities or in the midst of playing sports. Bone disorders. Individuals who suffer from a bone disorder, such as Osteoporosis, are more likely to break their wrist in even a minor fall. This disorder weakens the bones in the body and makes them especially fragile which means an individual is susceptible to fractures of this nature. Medical studies and research have proven that a fracture to the wrist or a distal radius bone can be caused by a direct blow to the wrist. The impact of the blow can result in the displacement of the wrist bone even in someone who has otherwise healthy bones. Age. Age can also be a contributing factor to injuries of this nature. Individuals sixty years of age and older tend to experience distal radius fractures more often than others. Fractures in the elderly are a result of weak bones or some other type of medical condition. Poor nutrition, use of illicit substances and women who are menopausal can sometimes experience a loss of muscle mass which makes them susceptible to wrist fractures. If you believe that you have fractured your distal radius bone then it is imperative to seek medical attention as soon as possible. When left untreated, wrist fractures can result in further complications that can have long-lasting effects. There are several distal radius fracture options available to patients. If the fractured wrist broke in a good position, our orthopedic specialist may simply apply a plaster cast that the patient will have to wear until the distal radius bone has completely healed. Splint and cast. In the event that the bone is out of alignment and it can potentially limit future arm or wrist use, then the broken bone fragments will have to realign. This can be done without a surgical incision. Once the bone has been positioned properly it can be set in a cast. The cast and splint stabilizes the wrist. Typically, the cast is changed every two to three weeks as the swelling reduces. In severe cases, the fractured bone is so much out of place that it can’t be corrected or realigned without making a surgical incision. An open wrist fracture will require surgical treatment as soon as possible. Surgical treatment methods can possibly affect the future use of the forearm or wrist. After surgery for a distal radius fracture, you may need physical therapy to strengthen and improve the flexibility of your wrist. Since there are several types of distal radius fractures and treatment methods, the recovery time can be different for each patient. Our Coastal Orthopedics specialist can work with you to formulate a recovery plan that can help you narrow down a time frame in which you’ll be able to resume normal activities. Your recovery plan can encompass pain management suggestions, which help with relieving the pain of your fracture. We’ll discuss, cast and wound care, since the caster and splinter are instrumental to the healing process. Promising wrist arthroscopy treatment measures means that more than likely patients can expect a favorable outcome in distal radius fractures. For the best results, be sure to communicate with our orthopedics specialist and adhere to your recovery plan. If you have reason to believe that you have fractured your distal radius and are in acute pain, you may first consult a physician in the emergency room at your local hospital. However, consulting with our Coastal Orthopedics doctor is important because our specialists have vast experience in working with patients dealing with bone injuries and conditions. Typically, your distal radius fracture is diagnosed through X-Ray. Imaging tests, such as X-Ray scans or an MRI, can properly diagnose and examine the full extent of a fracture. Contact Coastal Orthopedics today or complete our online form to get evaluated and treated for a distal radius fracture.